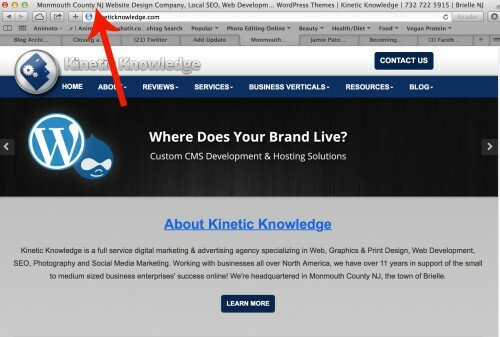 The title of your website is used on search engine results pages to give users an accurate description of your website. The trick is to create website titles that are SEO relevant for Google (and other search engines) and also user friendly for consumers. You only have about 55-60 characters to create a title that grabs the attention of Google and potential customers. Anything over 60 characters typically gets cut off- so choose carefully. It’s direct and to the point. It gives the consumer and Google precise information as to what we do and where we are located. More often than not, someone who comes across your website on a search engine will not be familiar with what you do. Your site’s website title (and other data like the description) can give them a little more information about your business and hopefully convince them to click through to learn more about you. Customers may turn to Google to find local products or services in their town. They may search phrases like ‘Monmouth County computer repair’. If a consumer performs a search query that matches up closely with your meta title, Google may place your website higher on the search results and bold the matching words or phrases in your title that match their search. This is why it’s important to think carefully before you create your site’s title. You want to think from the customer’s point of view. What might your potential customer type into Google to find a business like yours in their town or county? The answer to this question should help you formulate a meta title. Now that you are ready to start working on a website title, your next project will be to write a description that is equally as appealing to Google and consumers. Stay tuned for our next blog about how to write a website description or, sign up for our newsletter and have our bi-weekly tips and tricks delivered right to your inbox. Just visit our website, https://kineticknowledge.com, and scroll down to the bottom to sign up. Give us a call to learn more about our social media marketing and content marketing services. We can be reached at 732-722-5915.